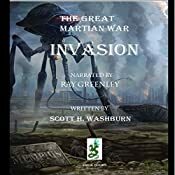 The ideas to fight the Martians were pretty cool, and the journey from ‘believing they’re coming back’ to them actually doing just that is exciting. The characters are well developed. Although the death of a loved one really can make you choose a different life path I was glad that the story evolved as it did. I’ve listened to a few of Ray’s books now, and this was a very refreshing change to the other style of Sci fi, more realistic and enjoyable. (the Martians POV was just great, to listen to and to think on, would they really think of us so badly… I guess so. I also think this was truly a good performance because of that, lots of different characters for Ray to dialogue, and they were great to listen to and easy to distinguish. It was nice to listen to Kevin again, and this premise interested me a lot due to the science of it. I must admit there was a lot to take in at first. But as each first chapter introduced us to the characters and to what was coming, I got more and more sucked into the story. Preppers do have the mentality attatched to them of being a bit on the wacky side, but I think in all honesty having some sort of stock about you really isn’t. Especially with the way the world seems to be heading. Maddison was a fab Mom and did everything she could to help calm her daughter down and protect her from even her own thoughts at first. Alex totally different gal, you think she’s this quiet kid who just wants to do what kids do, but she rescues her mom from a mugger with a golf club! There were some really tough moments in this story. And the more we got to know Maddy and Alex, and her husband Colton. The more we were routing for them being re-united. I think my only grip is that it’s so short. I know there’s a sequel, but I feel it’s actually really part of this story. It stopped at a good place after they met up, but the only thing that led me to want more was the bonus chapter/teaser. 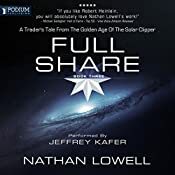 This audio book was given by the author, narrator, or publisher at no cost in exchange for an unbiased review via Audiobook Boom. Back with the crew on the Lowis! 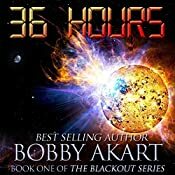 If you love sci fi character driven stories, this is the one for you…. I was so excited to get back to Ish and the crew. What a fantastic series this has been. I really did enjoy the full journey though, and the fact that Ish and Bev get together is just perfect, I wondered of the three who he actually might end up with if the opportunity arose. At most points through this book, I kept thinking, come on, I’m routing for him… the ship and almost dying, wow, really great writing and really awesome deductive work from Ish and the crew to get to the bottom of that problem. A mystery I was happy to follow, as I was with the problems they were having with the new crew member CC. I was looking forward to the next one, but now I’m not so sure. And I have to say, I think the only thing with it that’s bothered me is the preview chapters and then subsequent wanting to skip the first few in the next new book. I also got a taster of the next book, (book 4) before I cut the off switch. And I’m sad if there isn’t anything really written of his academy days, I mean to skip 4 years of his life… seems a huge switch. Maybe it will work or not, but sigh. I really wanted to see what happened there too. I am very much still looking forward to hearing the next book and following on with Ish and maybe Pip and Bev…. guess we’ll see when I get there.